Advanced search functions allow to review the data and find the specific information you need. Access the customizable result search folder from the software or directly from the instrument screen. Measurement reports can be customized according to your corporate guidelines. No matter where you are, use LabX Mail to receive a tailored message with the latest results, when a sample changer is ready to test new samples or when results are out of specification. In addition to data aquisition, LabX allows highly flexible bi-directional integration into LIMS, ELN, SAP or ERP, including import of task lists and product data base. Define users (Individual users) and roles (Lab Technician, Lab Manager, Quality Control, Administrator, etc.) 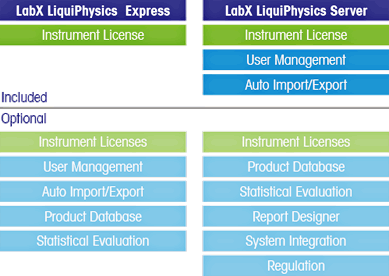 in the LabX® software. Access to functionality is based on the defined rights each user or role is given. Login to all your instruments and PCs on your LabX network with the same username and password or fingerprint via the LogStraight™ fingerprint reader.